Anyone who has had a pipe break underground, a toilet stop working, or a well pump fail can tell you Plumbers are Heroes. We offer service Monday through Friday, with an EMERGENCY LINE on the weekends at 507-429-7198. We focus on residential, light commercial, construction, and our rural farmers. Whether it’s a new building or revamping your current home, we offer a wide selection of name brand fixtures that are guaranteed to fit any taste and style. Please feel to call us for an estimate or set up a time to come look at what we have to offer. Some, but not all, of our major brands are listed below. If you have a clogged drain, leaking pipe, hot water heater trouble, or need a faucet replaced, we are here to help. 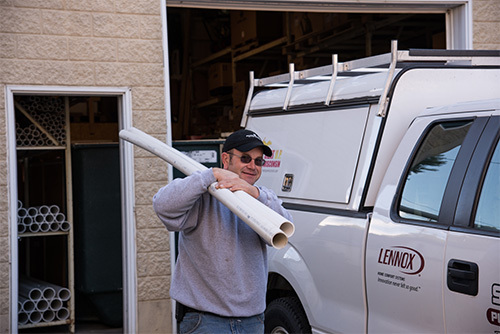 Our team of plumbers is not only focused on solving and fixing the problem, they will eliminate potential issues in the future, as well. Give our friendly office staff a call; we can diagnose over the phone and get our professional plumbers there in no time at all!